Dental assistants help the dentist during procedures as well as complete some on their own. When looking to hire a dental assistant employers not only consider the individual’s credentials but also helpful experience. A good objective can state these things and increase your chances of being selected for an interview and possibly the position. The dental assistant completes and assists with various dental procedures and as such, these individuals must possess certain skills. Assistants prepare the patients and tools for different dental procedures, which they must be certified to do. Along with those skills, individuals must display other common traits, such as customer service, organization, problem solving and sometimes administration, depending upon the scope of the position. Your objective statement should clearly indicate your ability to perform all of these tasks but it must be condensed into one sentence. Here are a few samples. Notice that every skill is not listed. It is best to focus on the key skills that you know the employer will be looking for. You can pinpoint these from the job posting. It can also be beneficial to state the actual company that you are applying to in your objective. 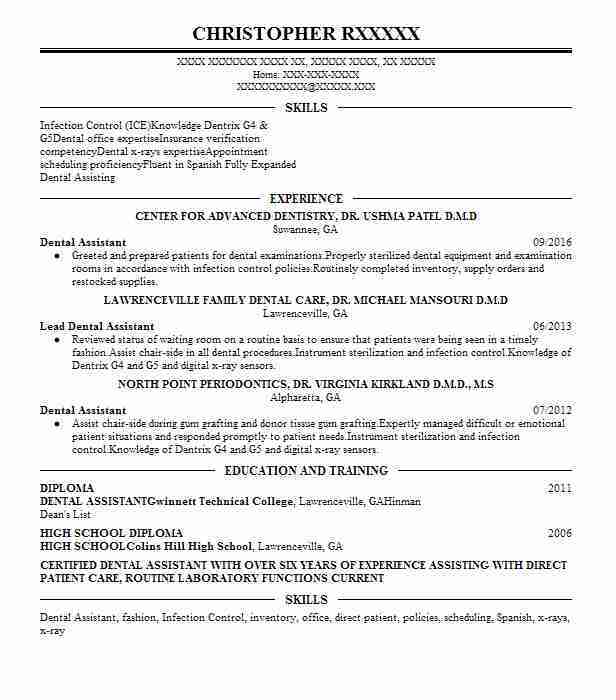 This helps to customize the resume and shows true interest. 1. Experienced dental assistant with keen client relations, organizational and administrative skills seeking an opportunity to advance within the field with a growing organization such as ABC Company. 2. 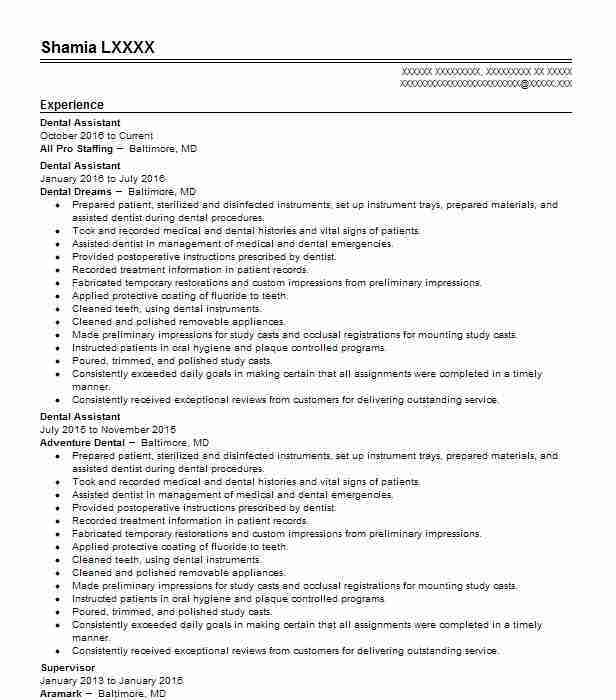 Customer service oriented professional with dental assistant certification looking to apply knowledge and administrative, problem solving and organizational skills in a dental assistant position with a notable dental practice. 3. Seeking to utilize excellent customer relation skills and administrative abilities along with dental assistant training to contribute to a thriving practice like ABC Company. 4. 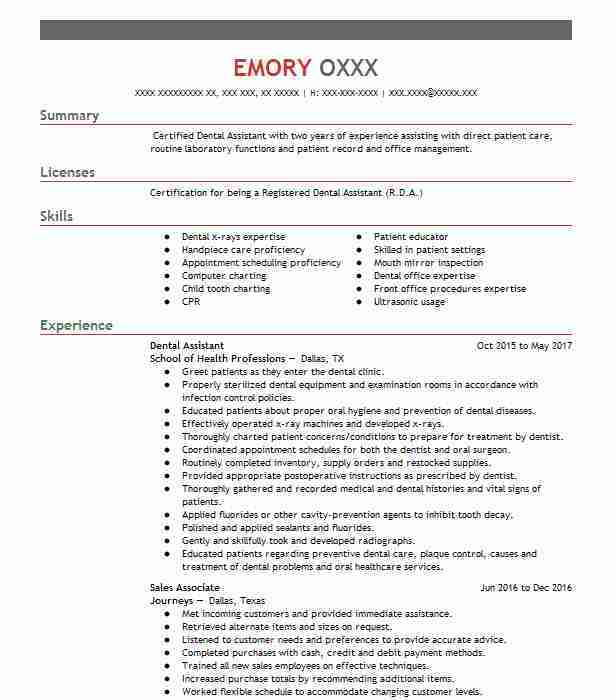 Detail-oriented, organized and trained professional desires to secure a dental assistant position with a budding dental practice. 5. Knowledgeable dental assistant graduate seeks to apply training, strong relational and administrative skills, and hard work ethic to a dental assistant position with a growing dental practice. Although your skills section should include a comprehensive list of your talents and qualifications, you also want to include a few key skills in the resume objective. This is the first paragraph at the top of a resume, and it is the first thing hiring managers read about you. Make it great, so employers feel compelled to keep reading and learn more. 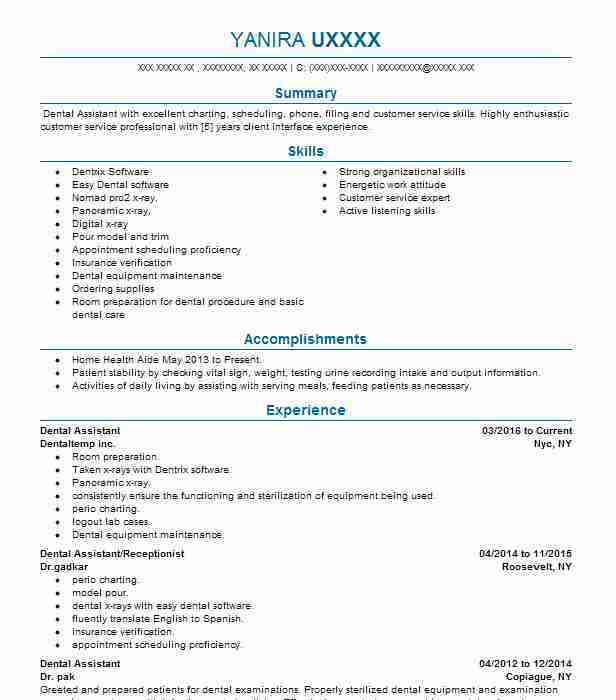 Dental Assistant @ Dentaltemp inc.